Douglas Gordon of W. O. Gordon Bindal & Co of Portmahomack describes the varied history of shipping the company's potatoes. All produce from our family potato business originally went out by ship from Portmahomack. I have one photo of two ships in Portmahomack harbour taken between 30th May - 1st June 1934 which, according to harbour records, was the only time these two ships were in the harbour together. The Argentum (95 tons) is in the inner harbour unloading 178 tons of coal and in the outer harbour the S.S. Edenside (147 tons) is loading up with 156 tons of potatoes. 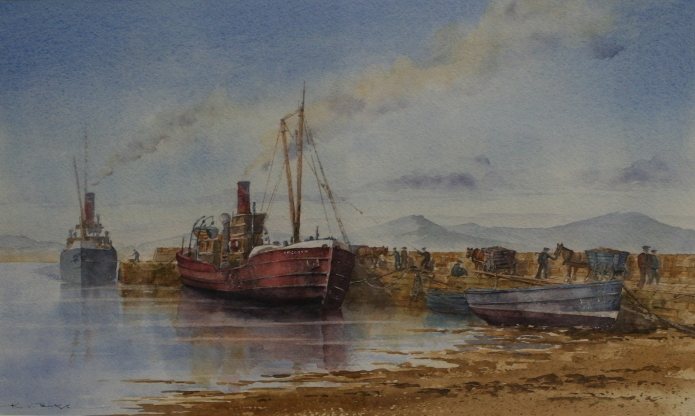 For my 50th birthday Ken Birks painted a water colour version of the scene. I said to Ken that that's our potatoes in carts - well it could have been our potatoes, as well as lots of other farms' potatoes too. It was a shuttle service with coal getting unloaded and the ships returning south with potatoes, all transported by horse and cart. My father, William O. Gordon, was still sending potatoes by ship from Portmahomack until 1950. They went down to Wisbech in Cambridgeshire and up the River Nene to the same buyers we are dealing with today, the Hartley's. One year a big storm started with our year's supply of seed potatoes on board and the ship could not sail for two weeks; my father hardly slept worrying about his potatoes! That's when he must have decided to send potatoes by rail from Fearn Station instead. All the farmers and local businesses owned the harbour trust and it was about this time it was wound up as more and more stuff was going by rail, not dependant on tides and weather. Also there were more lorries, which were able to carry bigger loads, but some farms still delivered by tractor and trailer to Fearn Station. The railway wagons could take either 10 tons of seed potatoes or 11 tons of ware (eating) potatoes. This translated into either 200 hessian bags of seed potatoes, or 440 paper bags of ware potatoes, which had to be manhandled into each wagon. They were stacked to the roof. Nearly all the farms were producing potatoes and they all came to Fearn station to get loaded into wagons by hand. It was hard work, but nice on a calm sunny day and not so nice if windy. The wind, full of dried potato dust and hessian bag hairs would blow into your side of the wagon. When it became frosty the wagons had to be lined with paper stapled on to the wooden sides and floor. 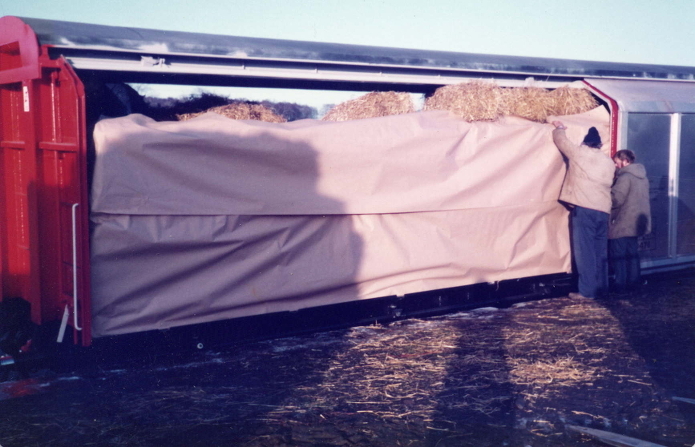 The bags were loaded on to a bed of straw with more straw against the paper lining as it was loaded, and once the wagon was full, straw was placed over the top of the bags to help keep frost out. The station staff would organise the papering of the wagons with big rolls of brown paper and, once loaded, they would put labels in a clip below the floor level of the wagon to say what was on board and where it was to go - all recorded by hand, and given to the guard on the goods train. Later the train would come to pick up the wagons. If you got a nice driver he would gently push against the wagons and they would be coupled to the engine with the empty ones left uncoupled at the back, if you had not finished filling them all. If you had the impatient type he would ram up against the wagons and, if you had not finished loading, all your stacked bags would end up in a heap and would all have to be pulled out and then rebuilt. 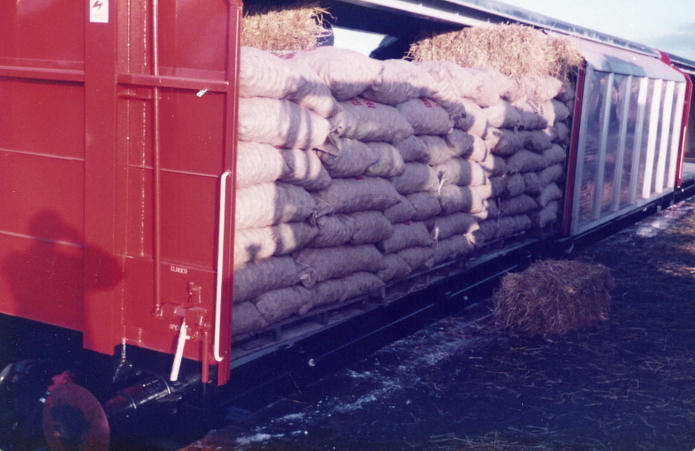 We got wise to this and when it was an impatient driver you would rush and fill the wagons with bales of straw to keep the bags stacked together, then shut the doors. After the necessary shunting, the guard would climb back on board to his nice cosy stove in the brake van and the train would head off. I remember we arrived at the station one morning to discover the wagons had not been pushed into the siding far enough. We had to drive across the rails with a forklift, release the train brake and use the forklift to push the wagons into the siding so we could load them. There was one really nice man at Fearn station called Willie Black, a real character, always quick with old stories which I loved to hear, and the different jobs he did on the railways over the years. The one story I always remember him telling me was when the Far North Line was blocked with huge drifts in Caithness and the far north was cut off from supplies or food by rail or sea. Two big steam engines with a snow plough in front came north from Inverness, Willie got on at Tain and they hit the mile long snow drifts at 50-60 miles an hour slicing through them to open the line once more. We are very fortunate we do not get these big snow storms now. We next started putting potato bags on pallets and roping then on, and then we got bigger wagons that could take pallets or boxes of potatoes loaded by forklift for one customer, but they still had to be lined with straw and paper in case of frost. Then the railways came out with a brand new wagon, VGA 28 tons, with fantastic long metal doors and sealed. We were the first to get them but then other firms found out about them and demanded them, so the following year we had the old wagons again. My father must have traded 70,000 tons by rail during his lifetime as a potato merchant. Once his brother, John O. Gordon of Balmuchy died, he merchanted all his potatoes as well, so it was a huge undertaking and a lot of organising. With the end of 'wagonload freight', lorries took over the transport of all our potatoes. For a while the railways did organise a haulier to pick up potatoes and take them to the railhead at Elgin, from where they travelled south to be delivered to the farmer. Then the Ness Railway Viaduct in Inverness got washed away in a flood and we never went back to the rail again.